A virtual private network (VPN) extends a private network across a public network, and enables users to send and receive data across shared or public networks as if their computing devices were directly connected to the private network. Applications running on a computing device, e.g. a laptop, desktop, smartphone, across a VPN may therefore benefit from the functionality, security, and management of the private network. Encryption is a common though not an inherent part of a VPN connection. 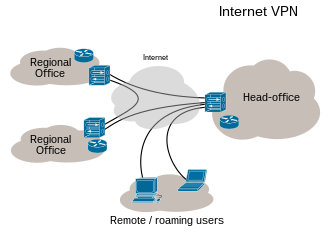 ^ "Virtual Private Networking: An Overview". Microsoft Technet. 4 September 2001. ^ "OpenConnect". Retrieved 8 April 2013. OpenConnect is a client for Cisco's AnyConnect SSL VPN [...] OpenConnect is not officially supported by, or associated in any way with, Cisco Systems. It just happens to interoperate with their equipment. ^ "Why TCP Over TCP Is A Bad Idea". sites.inka.de. Retrieved 24 October 2018. ^ Cisco Systems, Inc. (2004). Internetworking Technologies Handbook. Networking Technology Series (4 ed.). Cisco Press. p. 233. ISBN 9781587051197. Retrieved 15 February 2013. [...] VPNs using dedicated circuits, such as Frame Relay [...] are sometimes called trusted VPNs, because customers trust that the network facilities operated by the service providers will not be compromised. ^ "Encryption and Security Protocols in a VPN". Retrieved 23 September 2015. ^ "How can incorrectly configuring VPN clients lead to a security breach?". SearchEnterpriseWAN. Retrieved 14 August 2018. Kelly, Sean (August 2001). "Necessity is the mother of VPN invention". Communication News: 26–28. ISSN 0010-3632. Archived from the original on 17 December 2001. This page was last edited on 22 April 2019, at 07:36 (UTC).